A tray, designed by Nelipak Healthcare Packaging for Boston Scientific, has won a prestigious World Packaging Organization WorldStar 2015 Award announced recently in Colombo, Sri Lanka. The tray and lid combination package, an earlier AmeriStar winner at this years MD&M East show in June, was a mong 247 packaging projects from 37 countries to be judged. The Boston Scientific ACUITY® Pro lead delivery system package will be recognized in the Medical and Pharmaceutical category at the IPACK-IMA 2015 exhibition in Milano, Italy, to be held in May. Development of a single tray and lid configuration that contains one catheter and accessory set. 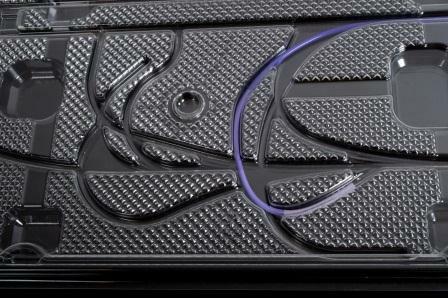 Flexibility on one tray and lid configuration to hold 16 different catheter shapes in custom-fit cavities. Protection of the catheter and accessories throughout sterilization, distribution and storage. Reduction in overall package volume resulting in less waste and storage space. This award is testament to the differentiated design capabilities customers working with Nelipak across global locations experience. Learn more about Nelipak design and development capabilities Contact Us to speak to one of our representatives.